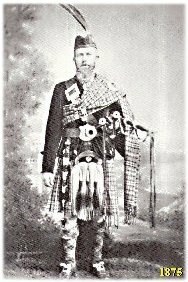 Sullivan Ross of Harrington (in Oxford County, 9 miles south of Stratford, Ontario) was born on May 9th 1828 at Badninish in Sutherland County, Scotland, on Achavandra Muir just south of Skelbo Wood and three miles north of Dornoch. When he was five years old, his parents Alexander and Margaret Ross left the croft at Bridgend where they lived. 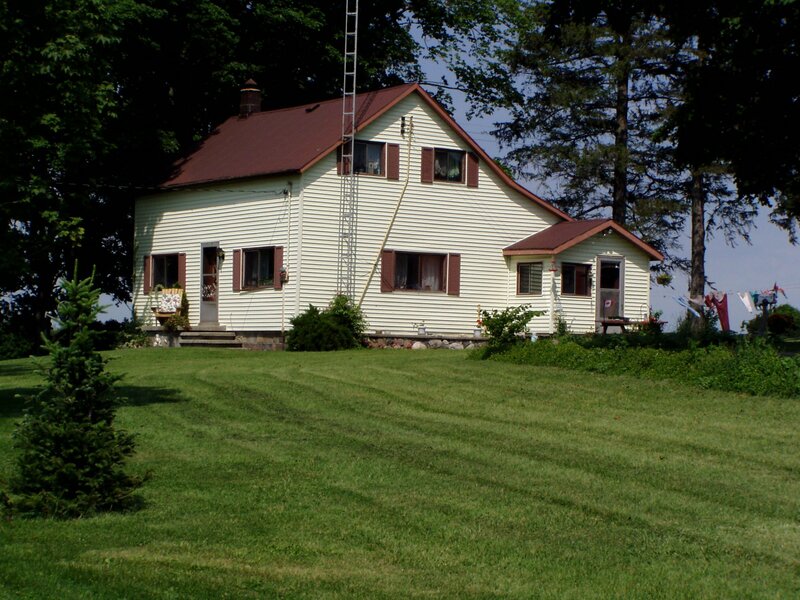 About 1838 they took Sullivan, his brother William and two sisters to Canada where by 1844-5 they were living in a log house just west and below the crest of a hill on a four acre clearing: Lot 31, W1/2, Concession 3 West Zorra, Ontario. The males in this pioneer family continued to clear the brush and wooded land after the sale of adjoining crown lands gave them possession of one hundred acres by 1859. The Census Report of 1851 noted that there were six offspring in the family, and in this year a frame house was built on the crest of the hill. When Sullivan brought his bride Margaret Matheson home in 1857, the 1861 Census would list ten members in this cramped household. Sullivan's father died in 1880 and left the farm to him, where he would remain until his death in 1880. Over the years, he had continued to collect tunes and to transcribe them most carefully into the four volumes which his grandsons rebound and indexed. As a musician and violin maker, Sullivan's life requires more than his obituary or the brief facts on his granite stone in Harrington's Presbyterian Cemetry, little more than a stone's throw from the land where he lived and died on 29 July 1904. The honour of having won one of the outstanding bagpipe playing championships of all time goes to a member of one of the Ross families in the famous Zorras. Sullivan Ross and his wife, Margaret Matheson, were both pioneers from Scotland. They settled on Lot 31, Concession three, West Zorra, in 1846. There seems no explanation of how the name Sullivan, of Irish origin, was bestowed on one of a family that had been Scottish for generations. The Rosses referred to are not related to the "Kirkhill" Rosses, the "Scotia" Rosses or other Ross families in North-west Oxford. William Alexander Ross, the youngest of the children of Mr. and Mrs. Sullivan Ross, was born on the homestead. He went to school for a time with Rev. C. W. Gordon (Ralph Connor), who spent his boyhood days on an adjoining farm, although the latter was much older. W. A. Ross farmed successfully for years near Harrington and now lives in Embro, where he is widely known as a musician. He is the author of The History of Zorra and Embro, published in 1908. In this volume many reminiscences of one of the pioneers, Donald Cameron, are given. Among them, Mr. Cameron describes a visit to one of the homes as a child with his father. It was a social gathering where one of the party, John McKenzie (Little Johnny), played a variety of bagpipe music. Mr. Cameron continued: "After one of these reels my father requested McKenzie to play a certain tune which appeared to be a favourite with him. While he was playing the piece I enquired of Sullivan Ross how he enjoyed the music. He replied that it was a rare treat to him; that he wished that he could perform a little on the instrument; but how little did we know that night that Sullivan Ross would bring back to Zorra the championship of America and gold clasp from the great Caledonian meet held at Lucknow in 1876, and which was never wrested from him." Mr. and Mrs. W. A. Ross (the latter formerly Mary Milligan) have two sons, Alex and Burns, both university graduates. 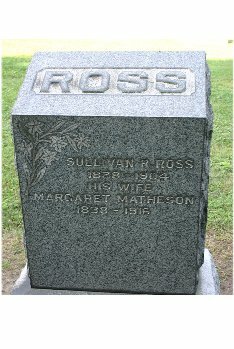 In the cemetery adjoining Knox Presbyterian Church, Harrington West, there is a memorial to Sullivan R. Ross (1826-1904) and Margaret Matheson, his wife (1828-1916). The photo in Sullivan Ross, Volume 1 (page x) was captioned "Sullivan Ross in front of his farmhouse at Harrington ca. 1900 with his wife Margaret Matheson and two nephews". Only two photographs escaped the bonfire set by his widow in Embro in 1913. On November 17, 2010, Sullivan's great-grandson David A. Ross attached a scan of the photo to an email. 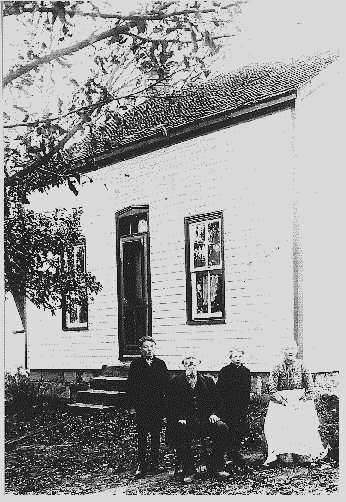 He referred to the nephews in the picture as his two cousins (Jim and Bill McLarty) taken about 1900 in front of their house near Harrington, Ontario. A couple of days earlier, David sent me a more up-to-date photo (Nov. 15, 2008) of the farmhouse, which you may view if you CLICK HERE. Athole Brose, including tunes collected by Sullivan Ross. Music by Allison Lupton, whose interest in music began in West Zorra Township. For their part in ensuring that I received a copy of Sullivan Ross, Volume 1, my thanks go to Colin R. Blyth, editor at Iolair Publishing in Kingston, Ontario, and David M. Hunter, webmaster and past-President of the Scottish Studies Foundation in Toronto, Ontario. I am grateful to David A. Ross [email: rossschu@q.com] of 6485 Brentwood St., Arvada, Colorado 80004, great-grandson of Sullivan Ross, for providing me with several newspaper clippings, all of the photographs on this page and a copy of Sullivan Ross, Collection of Pipe Music compiled by Iain G. Millington in 2007. Both aforementioned books contain the following credit line: © Canadian Museum of Civilization. Clan Ross Canada acknowledges the role of the Canadian Museum of Civilization, Hull, Quebec, in preserving the contribution of Sullivan Ross as one of the earliest composers of bagpipe music in Canada. His collection of tunes is also becoming more well-known due to their care and consideration.